There is no place on earth that exudes a chic lifestyle more than South Beach (SoBe, if you are in the know), Miami. Just spend one evening at a sidewalk café on Lincoln Road and see style and glamour at their very highest level. Then spend a day walking through this part of Miami and be in total awe of the styles of South Beach homes, hotels, condominiums and everything else is SoBe. South Beach real estate is like no other in the country. The elite of the elite live in this part of one of the most fabulous cities in the country. Here, there are spectacular palace-style mansions, elegant contemporary oceanfront condominiums and cool, loft-style residences that are unlike anything else. This 8,200+ square foot residence is the culmination of combining three units into one extravagantly beautiful home in the Continuum. Situated on the southernmost tip of Miami, the views are the most awe-inspiring of any in all of Miami with the Atlantic Ocean as far as the eye can see. Residents enjoy these views from floor to ceiling windows throughout the home or the expansive and perfectly adorned balcony wrapping around the all sides of the residence. Other amenities (typically standard in properties of this caliber) include a home theatre with comfortable leather seating, an AMX customized security system, audio/video network with custom touchscreen panels in each room, a large master suite with the king of all walk-in closets, a long and large galley-style kitchen with the best of everything in terms of fixtures and finishes and so much more. With seven bedrooms and seven baths, this home is available as a seasonal, furnished rental and is a true showplace. From high-style condominium living to living the life of royalty, this majestic masterpiece comes from the collective efforts of design artisans and European craftsmen. 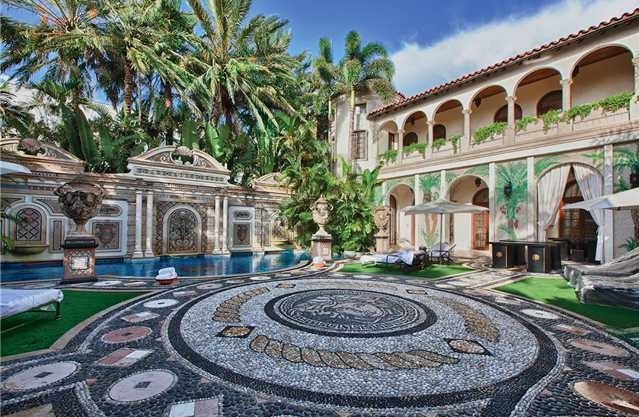 From the 54-foot long mosaic-tiled pool to the hand painted walls and ceiling frescoes, this 23,462-square foot home is like an Italian palace. Whether renting for short or long time periods or for a special event, it offers 10 bedrooms that are lavishly appointed and swathed in luxurious fabrics, beautiful furniture and the finest finishes. A custom designed courtyard with fountain and custom marble tile flooring is the focal point from balconies and terraces all the way around the residence. Situated on the exclusive Ocean Drive, this home is the quintessential South Beach Miami mansion. 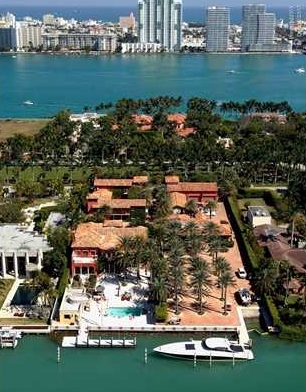 Live among celebrities and high-profile people in this 9,900 square foot home on Palm Island. With six bedrooms and six and a half baths, it is the perfect estate home that is a showplace yet very livable. It features beautiful Bay and South Beach views along with a private dock, heated walk-in pool and swim-in grotto with waterfall. All of this is adjacent to the home from an incredible outdoor living area perfect for entertaining those celebrity neighbors. Inside, this it is perfectly appointed but very comfortable with beautiful fixtures and finishes. There is a fantastic game room with a pool table and bar area as well as a movie theatre and an enormous suite with a private bath that rivals many homes on its own. The rental rate is quoted for a furnished three to six-month rental. Reminiscent of a Mediterranean palace, this large estate on tony Star Island is the epitome of luxury South Beach living. It is lavishly appointed with hand painted walls and ceilings, gold-adorned finishes, and luxurious fabrics and furniture seen only in the homes of kings and queens. Large bedroom suites add to the exclusivity of living on Star Island. Outside, the tropical landscaping adds to the beauty of this estate that ends at the private dock on Biscayne Bay. Residents can sit by the pool on the incredible pool deck that showcases the beauty of the home and the views. An unbelievable outdoor living and dining area make this the perfect home for entertaining friends and family. Heading back over to Palm Island is the last of the top five list with this 9,200+ square foot estate. Attention to detail is the best description of this majestic showplace that is not over done. Arrive along the circular cobblestone driveway and head to the back to enjoy the Miami sunshine by the beautiful pool with a waterfall and Jacuzzi or while relaxing in the outdoor living area during a barbecue in the outdoor kitchen. The tropical landscaping provides the perfect amount of shade and atmosphere for everyone. Inside, there are massive vaulted ceilings in the main living areas as well as a home fitness room, home office lined with book shelves, a game room, home theatre and so much more. With beautiful artwork on all of the walls, this is a perfectly suited home for those who want to spend part of the year in Miami in a manner to which they are accustomed. For most any South Beach rental property, luxury is a top priority no matter the cost. From these lavishly decorated estate properties to more modern properties, South Beachrentals offer an ideal lifestyle in a beautiful tropical atmosphere. These places are heaven! No wonder most people wanted to consider these rental properties! In my opinion, if you have money to spare, this is the best for you.